There's obviously a lot of different variables that determine when someone feels like the time is right to ask the big question, so you shouldn't get to worried if you've been seeing someone for longer than the average. If you feel like you've waited long enough and want some numbers to compare yourself to though, the average number of years that a couple is together before getting married is somewhere around 3.5 years. Some couples are so in love they can't wait that long, and other couples wait longer because they worry about ruining a good thing. If you want to further explore the possibilities of why your partner hasn't asked yet; or maybe you're wondering if it's time that you should ask your partner to marry you, read below as we look at a bunch of the factors that come into play when finding the right time to drop to your knee and ask the biggest question of your life. As we said before, the average is somewhere around 3.5 years. That time can be divided a number of ways. You might spend more time dating while living separately, and then once you move in together, put things into high gear because of how much you enjoy living together. Of course the opposite is also possible. You might rush into cohabitation, and then once you live together, want to stick with that arrangement for a while so that you can see if it's really meant to last. Everyone knows in their heart and mind (regardless of their insecurities) what's best for them. It's not always easy to find that information within yourself, but it's there. If you're looking to get married around the same time as everyone else, then have at it. It seems to work out well for a lot of people. But are you sure that it's going to work out for you? Maybe you don't consider yourself average, and even though you're curious about how others are handling this huge life decision, you aren't interested in falling in line with the status quo. If you're a free spirit who does things their own way, why would you divert from your path on this one thing (which is a huge one)? It could upset the balance of your universe completely. Things that you would have made a quick decision on, might now be something you aren't able to move as quickly on, and because of that, opportunities that are key to realizing your goals can be missed. If you're pressured by your partner, but you don't feel ready; remember that there are plenty of fish in the sea, and your perfect match should understand what your priorities are, and support you in succeeding to reach them. You've come this far as your own self. Keep going, and when the time is right, you're with the right person, and you feel like you've accomplished enough that you're ready to give up a little more time for a significant other, you'll know. We all have friends who're married, but whose relationships we don't don't understand. THOSE FRIENDS are the average. Be YOU. You'll end up much happier for it in the end, whether you're with your partner for 1 year before getting married, or 10. A lot of people start wondering about the average time a couple is together before getting married when they're concerned with their age. They worry that they're getting to old, and that they need to settle down ASAP before they run out of dating options. The truth is though, that people are getting married much later in their lives than they used to. This can be attributed to a lot of things. Some people are too focused on their career aspirations early in life, and can't find the time to date for love, and spend their 20's dating casually, hooking up with lots of different partners, while focusing their emotional energy on their work. Other people just take a long time to find the person that they want to settle down with. The pressure to get married in your early twenties doesn't exist in a real form anymore. If it's still a reality for you, it's a creation of the media that's run by older generations. You could find yourself unmarried at 40. We know that might make you gasp, and yell, "Not me!" at your screen, but depending on how you've spent those years, it really wouldn't be that bad. We're often far more comfortable in our own skin as we get older, which allows us to know exactly what it is that we need or want in our lives, and from a partner. The needs that we have in our twenties are very different from those that we have later in life. Often, we grow alongside our partners and those needs are met through that growth, but we've also all dated someone who refuses to grow up. What if you married an adult child in your twenties, and find yourself approaching middle age, with a partner who hasn't grown as much as you have? You'd be in the same spot (if not worse) than if you had been spending that time on other areas of your life. '40 is the new 30' has been going around as an expression for a long time, and when you're younger, that often seems just like old people trying to fool themselves that they aren't as old as they are. When you get to that age though, you'll see that there's some truth to it. It's a bit of a stretch, but we've even read '50 is the new 30' in a few places. People are finding happiness later and later in their lives. Don't worry if you think that your prime is passing you by. It's yet to come. Truly. Maybe you've found yourself going to what feels like dozens of weddings over the recent years, as all of your friends tie the knot. Maybe you're beginning to feel like you might be destined to be the single one in your circle of friends. Every group of friends has one of those, right? We guess that odds are that most do, but it rarely has anything to do with them being undesirable, or undatable. A lot of times that single friend is a divorcee, who married the wrong person early in life, before they knew what they wanted in life or a partner. 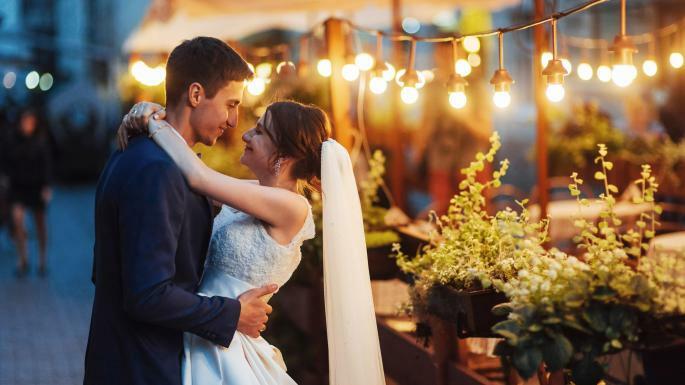 We know how long the average couple is together before getting married now, but the majority of those proposals are rooted in just knowing when is the right time to propose. It's not because they've been waiting for that moment to present itself. If you have marriage on your mind too early in a relationship, and you can't shake it, even though you know you're probably not at that point yet, you have to consider how that affects your behaviour. If you've been dating for maybe 5 months, and things are as good as any relationship that you've been in before, a lot of that will because of the relationship's care-free nature. You're not sweating the stresses of marriage yet. You're in the moment. It's exciting. But once you start thinking about marriage, and it's a one-sided thought, there's going to be some awkwardness (whether intentional or not) that might end up keeping you from getting to the church on time. If your urge to marry your partner is a seemingly unstoppable energy rushing through you every time you look at them do one of those adorable things that only you think is cute, then who cares about the average couple, and how long they wait? The feeling inside you tells you that the time is now. You're surely at a point in your relationship where you have a good sense of where your partner is emotionally, and whether or not they'd be into being proposed to. Though there are lots of advantages to being married for certain pragmatic things like tax breaks, and cheaper insurance, the number one reason that people get married (even though the world can be an extremely jaded place) is L.O.V.E. If you've been hit by cupid bad, and you sense that your partner has been too, you owe it to yourself to at least bring up the topic. They could be worrying the same as you, and afraid that it was too soon. The idea of there being a right and wrong time to get married has broken up a lot of relationships throughout time. Don't let it interfere with yours. We're not entirely recommending it, but there have been people who've gotten married the same day that they met. They just knew. If it feels like a sure thing, cut to the feeling, and take the plunge. DJ Jazzy Jeff and the Fresh Prince knew what they were talking about when they wrote "Parents Just Don't Understand" back in 1988. For some of us, once we've been in a relationship for a year or so, our parents often start putting pressure on us by asking far too often, when we're going to get married, or when we're going to give them a grandchild. Thankfully the grandchild question usually doesn't happen until after you're married, but there's always exceptions. The unfair expectations placed upon your relationship by this frequent questioning can create anxieties that you don't need, and should be avoided at all costs. Being in a relationship is difficult at the best of times. Your parents will often have the best of intentions, but they probably had to go through the same questioning when they were younger, and surely didn't enjoy it. Perhaps ask if they remember how it felt when their parents kept bothering them about their relationship, and see what they say. If they come back by saying that they were married long before however old you are right now, so their parents weren't worried... Just tell them to take a page out of their parents' book then and don't be worried. Lay down the law with them, and tell them that by pressing the issue, they might actually be creating rifts that could end up ruining your relationship, which would set you back to the beginning, and then they'll really have to wait for those grandkids that they want (and you probably aren't even sure you want to give them). If you're waiting for your significant other to propose, and you feel like they want to, but there's just something that seems to be holding them back, we suggest that you take the initiative and do it yourself. The length of time the average couple is together before getting married won't matter to you as soon as you get the question out in the open. Wanting to compare your own relationship to the relationships of others is normal, but it's also often unhealthy. You probably have friends who've been together for what seems forever, but aren't married. Maybe they just don't plan on getting married. Maybe they're in the same situation as you; wondering when your partner's going to propose, and when the perfect time to do it will be. Maybe their parents have made them anxious about their relationship without being asked for their opinion. There are so many different scenarios that couples find themselves in before they get engaged, and many of them stressful. The freedom that comes with someone just saying "here goes nothing!" and proposing is astonishing, and we think that you'd probably love it. So if you feel like it's time, and your partner's going to be receptive, you need to get down one knee, and ask that one big question. Did we teach you a thing or two about how long couples are together before they get married? If so, then why not take a peek at our other great relationship advice guides NOW RIGHT HERE! Is your significant other bringing up their ex too much? Find out how to handle this situation now by reading our article HERE! !